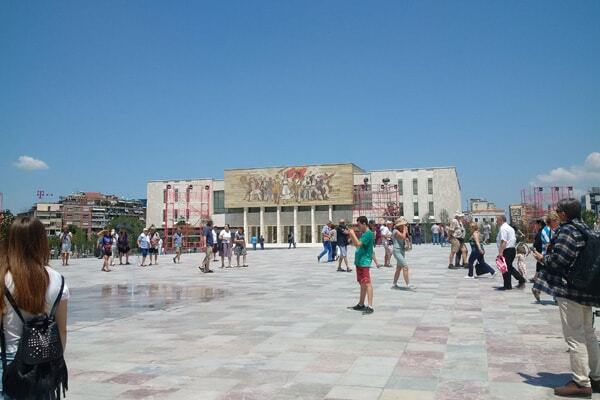 Scanderbeg square reopened on Saturday, 10th of June, in a great atmosphere, never seen in Tirana for many years. It had triggered curiosity to that extent that people couldn’t wait to see it. That is also due to the fact that the restoration of Scanderbeg square has been used as trophy from one political party over the other, once in power. As such, it has reflected the vision of each of them in different periods of time. Its history has involved in debates not only political parties but all civil society too. The big question here is: Should we change this square, modernize, use it to citizen’s benefits or keep it untouched as in old times. 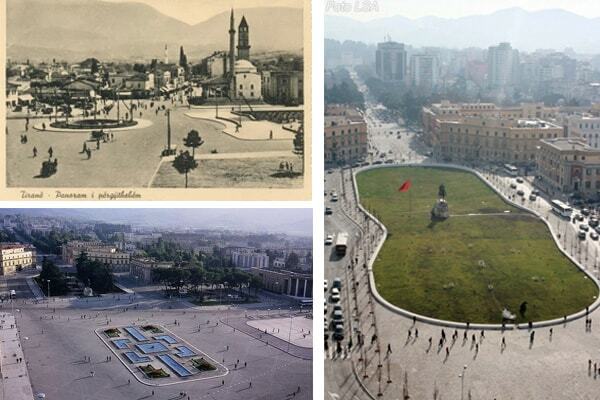 It is a known fact that the main square of Tirana has changed several times since the first time it became a square. The history of the square started in 1917, about 100 years ago, when the first parliament was built in Tirana, which now is the Puppet Theater. Then during the time of King Zog, the first Ministries of Italian architecture were built in this place in a perfect harmony. The Scanderbeg Monument was placed there in 1968 during dictatorship. It was a work of sculptor Odhise Paskali , while the square was restored again with a fountain in the center. It was the time the regime built also the National Opera, the National Museum, and Tirana International Hotel, which made the skyline of the square. It was that shape of square that lasted longer and was remembered from most people who were born in Tirana. Some of them are grown up with a lot of memories here and are being conservative and do not want to see it changed. But the dictator Enver Hoxha put also his monument on this place, which was toppled by huge protests of students on the eve of democratic changes in Albania on 20 February 1991. The first debate sparkled in 2008. Prime Minister Edi Rama, mayor of Tirana that time had the idea of doing this new square that we have today. He wanted to do it during his mandate but due to the conflict with DP who had the central government, the project wasn’t approved. The square remained in total dysfunction until Lulzim Basha from DP took the office of Mayor at Tirana Municipality. Mr, Basha arranged the square and mostly turned it into a functional area like a big roundabout for cars, all covered in grass. It was not a pedestrian place and the chaotic traffic wouldn’t’ let people or tourists enjoy the place. People couldn’t stay for long in this square. It was not even a square. All the concerts or big political gatherings in the last decade were shifted to Mother Teresa square at the other end of Martyrs Boulevard. So, no use practically, just traffic deviation. What do we have now? A giant pedestrian area and according to Mayor Veliaj, the biggest in Balkans. This is the most positive thing and value of this new square. Tourists and Albanian citizens can walk around the center; visit the Museum, The Mosque, and the Scanderbeg Monument, National Bank undisturbed by crazy cars. They can take photos, stay for a while and rest under the trees around the square. The elements of the new square are: almost 28 000 square meters paved with tiles from all the places where Albanians live. This stoned pavement has a form of shallow pyramid with the highest point in the middle at about 1.80 m. You can walk easily to the top of it. The meaning of it is that everyone can stay in this place and feel that he is somehow important. In other words in the center of attention for this square is citizen. And all the stones from Albania and diaspora, symbolize the unification of all Albanians. The square has more than 100 fountains with fresh water, to keep the place cool during the hot summer. The Scanderbeg Square, The National Opera, National Museum and National Bank surround the stone pavement, while behind these buildings, there are planted trees from all over Albanian territory. Mini- parks, benches, flowers, platforms for taking photos or altar for getting married, are part of the square. There are 32 square meters planted with different aromatic trees and 90 000 square meters walking area, while the underground parking can allow about up to 300. 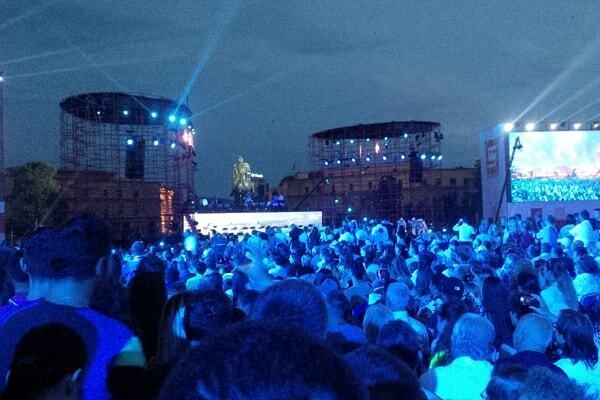 There are still debates between the political parties about the new square. But the square now is back to citizens and they started to enjoy it. At the same time it also helps solving a huge problem, parking in Tirana. 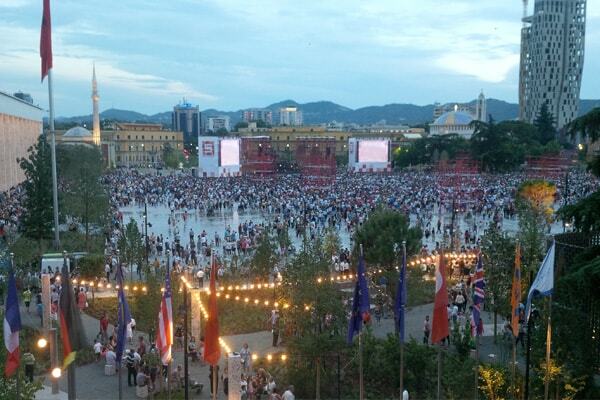 Some elements are not finished yet, but the first two days the square was full of Albanian citizens and tourists. 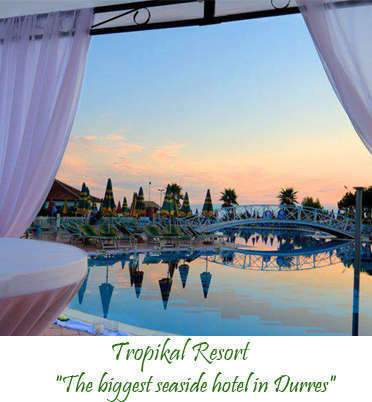 It is going to be probably the most popular destination for all tourists. It can also be used for big concert, Tirana ddidn't have a designated place for open air concerts. In the first two nights it was used for this purpose. What we hope is to see it clean and well-kept every day. We have to use it in creative ways, give it life and then travellers will get interested and visit it as well. 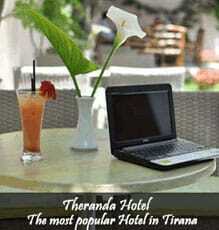 It is a true fact that Tirana is becoming one of the most interesting destinations in Albania in the last years. There is no other European Capital where you can find such a mixed history and architecture, where you can enjoy traditional hospitality and streets full of young modern good-looking people. This is our city Tirana, the Albanian Capital with a modern square named proudly after its National Hero, Skanderbeg.